Saw this some time ago but missed out on writing about it. 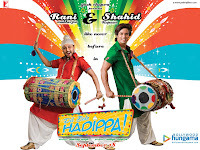 After watching the latest offering from Yash Raj Films your Dil does'nt exactly go 'Hadippa'. Yash Raj Films better look deep into their story writing department and make amends. What 'Dil Bole Hadippa' does is, it gives you an average time-pass entertainer along the lines of WANTED. The tale is of a young Punjabi lass Veera Kaur (Rani Mukherjee) who wants to play cricket. There is a team whose owner Vikram Kapoor (Anupam Kher) calls his son Rohan (Shahid Kapoor) back from England where he plays cricket. It is his dream that the local team win the 'Aman' (peace) cup which is held annually between the local Punjabi team and a team from Pakistan. Unfortunately for Veera, the bias against women and the fact that it is a males only team forces her to dress up as Veer Pratap Singh. There follows the usual comic instances of mix ups with rohan falling for Veera and expecting veer to help out with the romance. Largely predictable, the tale does not do much. the only entertaining factor is Rani Mukherkjee, who looks fabulous and is absolutely adorable as Veer Pratap Singh. The rest of the cast puts in a standard performance. What makes sure that this movie does not rise above standard fare is the very basic story and unimaginative plot. Is it worth watching ? Wait for it to come on TV. Will give it a miss!